Wichita State head coach Gregg Marshall is doing all he can to try and match his Shockers against the mighty Kansas Jayhawks. KANSAS CITY, Mo. — You float the idea that maybe, just maybe, there’s some sunny, happy medium. Something that can bridge the 164 miles between them, some way that Wichita State could meet Kansas in the middle. And by the middle, we mean K-10. "I’m not going to just be bought," the decorated Shockers coach says. "I’m not going to go to Allen Fieldhouse for a check." 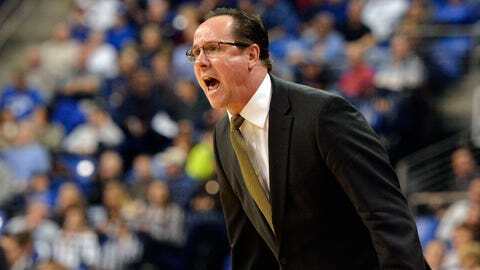 We love Gregg Marshall, and not just because he coaches like he’s on a rolling 10-day contract and his players play like the jerks on the other team just swiped their kid brother’s lunch money. It’s also because the next bush he beats around will be the first. "We’d like to play home-and-home," says Marshall, whose 10-0 Shockers finish the SEC portion of their non-conference dance card with a trip to Alabama (5-4) on Tuesday night. "Ultimately, we’ve got to put ourselves in a position where playing (the Jayhawks) or not playing them has no bearing on our success, and that’s what we’re doing. "It would be helpful, but still, we’re putting ourselves in a position where it doesn’t matter if they want to play or not. That’s what we have to do. One day, when it behooves them, then maybe it’ll happen." The other metrics are on board with that pecking order, too — to a point. Stat wizard Kenneth Massey’s weekly composite of computers and polls on Sunday placed Wichita eighth nationally and KU 12th. Although KenPom.com’s formula gives the Jayhawks an edge (KU: 6, Wichita: 14), as does the unofficial RPI (KU: 4, Wichita: 12), the consensus is lucid enough: the Jayhawks and Shox may not share an area code, but they both belong in the same class picture now, along with all the other hoops heavyweights. "(Kansas) is a special program, they’re elite, and we know that," Marshall says. "We’re just trying to be the best that we can, consistently. And if we can be in the same conversation with them, it’s usually pretty good." If they could be in the same building with them — something that hasn’t happened since 1993 and has never happened since Bill Self took the reins up in Lawrence in 2003 — it would be even better. Marshall, for his part, is ready and willing. Not only that, he says he’s even pitched a three-game series to the KU camp — and, as a perk, none of those games are at the Shox’s cozy, raucous Koch Arena, better known as "The Roundhouse." The set-up: One game at Allen Fieldhouse, one at Sprint Center in Kansas City, and one at Intrust Bank Arena in downtown Wichita. "It’s out there that we will play anybody," Marshall continues, "and the better the team, the better for us. And we’ll start on the road." That’s what happened with Tennessee’s Volunteers, who handled the Shox their first loss during a showdown last December 13 in Knoxville and were beaten last Saturday, 70-61, in the return leg at Intrust. The Wichita boss says he approached Volunteers coach Cuonzo Martin — the former Purdue star who won a Missouri Valley regular-season crown with Missouri State — before Saturday’s game about extending their series, "and he said he would consider it." Because while Marshall respects The Phog, he doesn’t fear its ghosts. Since the fall of 2011, the Shockers have played 11 non-conference opponents ranked in the RPI Top 75 away from the claustrophobic confines of Koch Arena. Their record: Eight up, three down, and a mark of 6-1 since November 2012. Anytime, any foe, anywhere. "When I looked at that schedule last year, and Darron Boatright is our AD for basketball; Eric (Sexton) is the head AD, and Darron helps put the schedule together and helps with organizing all that stuff," Marshall says, chuckling. "And I was giving him crap. I said, ‘Man, this is ridiculous. There’s no gimmies … you can’t take a night off and beat Oral Roberts. You can’t take a night off and beat Davidson. And he said, ‘Well, you’re trying to beat the best.’ And I agree." Another fun nugget: Since 2010-11, guess which Division I teams have posted the best winning percentage on the road? No. 2, Kansas (24-8, .750). No. 1? Wichita State (28-8, .778). Meanwhile, Kansas State is playing a marquee opponent in Wichita this weekend — but it’s not the Shox; it’s a date with No. 21 Gonzaga. "I think (our success) can work both ways," Marshall says. "I think the better we are … if we can be continually as good and sustain excellence like Gonzaga, that’s how Gonzaga gets these games. It behooves K-State to play Gonzaga. "That’s ultimately what we’ve got to do, is just sustain it, and they ultimately won’t be able to avoid it; it’ll be good for them." It’ll be good for the Jayhawks, too. After all, it can’t be that the Shockers don’t fit the profile competitively — Self, by his own admission, overloaded his 2013-14 pre-conference slate with toughies, and toughies away from Lawrence; his young KU squad will tussle with eight non-conference opponents among the RPI Top 75. Of the five of those Top 75 tests that took place on road or neutral floors, the Jayhawks went 2-3. "KU doesn’t normally lose three games, especially this early — sometimes, they don’t lose three games all year," Marshall says. "Give ’em credit: (They’re) playing on the road and playing a great schedule." "It would just be nice if we were one of them."